Need a simple old fashioned quick bread recipe? Applesauce bread is a simple quick bread that uses basic ingredients. Old fashioned recipes are some of the best recipes to make. You know the kind I am talking about. The kind like many of our grandmothers used to make. They are the recipes that are simple. They use basic ingredients. You can make them anytime you need to because you almost always have the ingredients on hand. Often times we look for new and updated recipes. We want something current and fun. But I think our mothers and grandmothers had it right when it came to most food and recipes. They kept it simple. I have no desire to go back to the days of using lots of margarine, Crisco, and lots of things that come in packages and boxes. What I am talking about is the basic foods that you make from scratch. The simple homemade recipes. Homemade food doesn’t have to be complicated. It can be easy to make and still be delicious. Recipes like old fashioned applesauce bread are examples of that. Applesauce bread is easy to make and tastes so good. If you have never had it, it is kind of like applesauce cake, but in bread form. 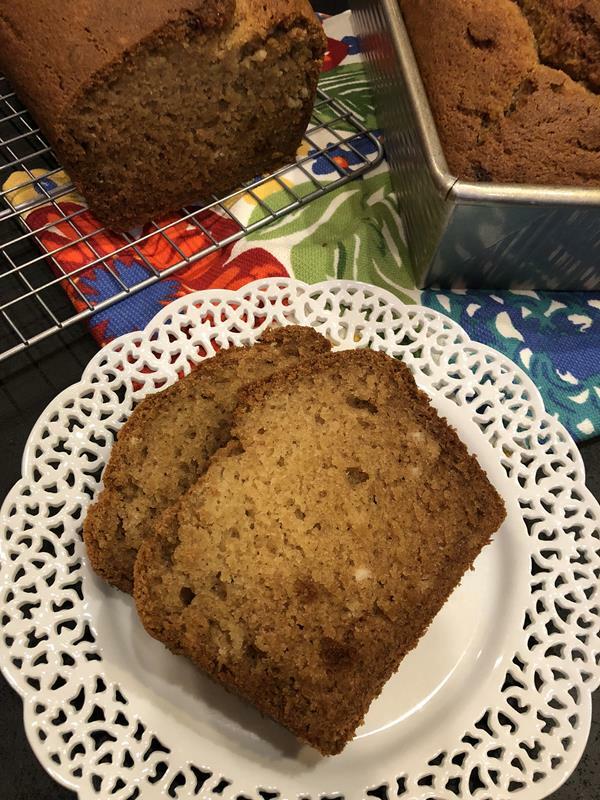 Applesauce bread is one of my favorite quick breads to make. My whole family loves it. I love that it can be used for breakfast, lunch, snacks, and dessert. I keep this bread simple and skip the chopped nuts since our family can’t have them, but if you can have nuts they would be really good added to this applesauce bread. Can Applesauce Bread Be Made Into Muffins? Yes, it can. Just bake in a prepared muffin pan for 18-20 minutes or until toothpick inserted into the center comes out clean. Yes, it freezes great. This is one of those recipes that is great to double or triple. Let it cool completely. Wrap well and freeze. You can also let it cool, slice it, and then freeze it in individual portions for easy lunches or snacks. 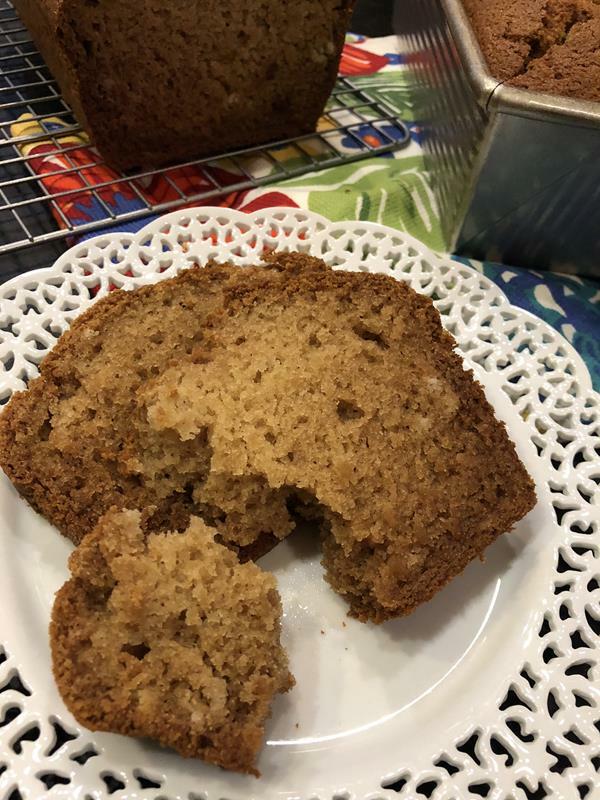 Can I Make Applesauce Bread Gluten Free? Yes, it works great gluten free. Here is the recipe for my Gluten Free Applesauce Bread. I show you how I make it gluten free. Love Quick Breads? Give One of These A Try! 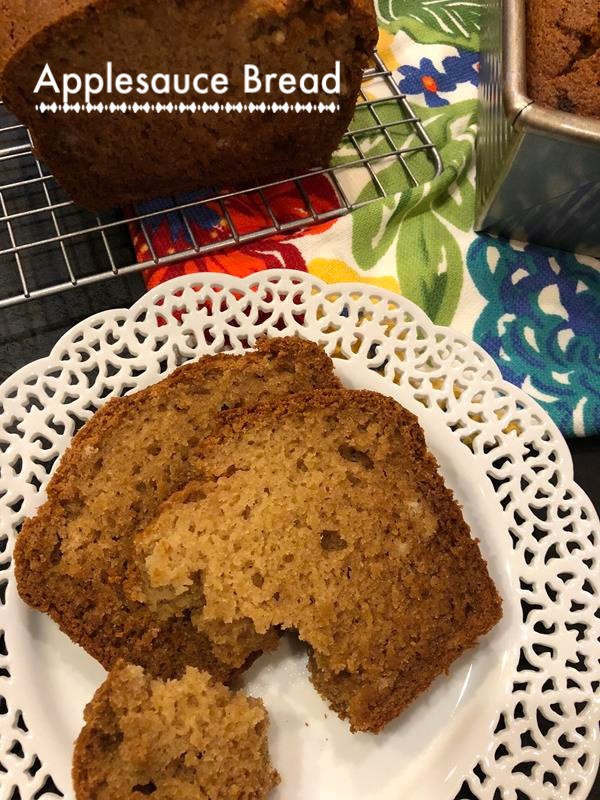 Martha Stewart’s Banana Bread– This is my favorite banana bread recipe. 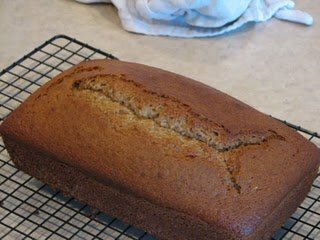 A simple old fashioned applesauce bread recipe. this looks like something all my family will enjoy. I bet it would make great muffins, too. I think it would make great muffins. I had thought the same thing. Which nuts go best with the recipe and how many! I would probably do walnuts or pecans. I think walnuts are the more traditional choice to mix into apple recipes, so that is probably what I would use, but I think pecans would be good as well. I would use anywhere from 1/2 cup to 1 cup chopped nuts. If you really love nuts I would say closer to 1 cup. If you like nuts, but just want a slight nutty flavor I would use more like 1/2 cup chopped nuts. I hope that helps and that you enjoy it! I just had to let you know. I just made this with my 7 year old daughter. Your recipe is so easy but so good. I do not own a bread loaf pan so I actually baked it in a 8 x 8 square pan and it came out AMAZING! It is so good, my daughter and I are baking another one now because we have already eaten half of the first pan we made. Thank you so much for this wonderful recipe. It will definitely be going into our family rotation. Thank you! I love hearing that your daughter enjoyed it so much. I love sharing easy everyday food, so comments like this make my day. And thanks for letting me know that it worked fine in an 8×8 pan. I have done that with other recipes, but not this one so I am glad to know that it worked.